65 West Bayard Street Seneca Falls, NY. 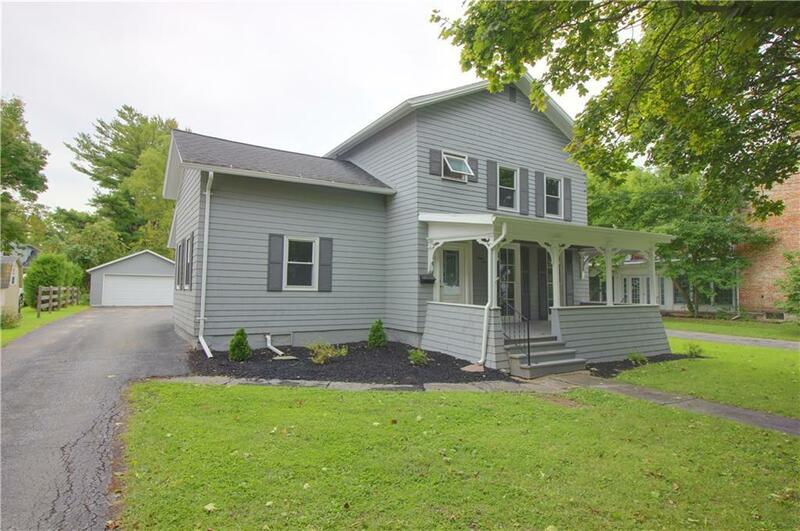 | MLS# R1150740 | Coldwell Banker Finger Lakes | 315-789-6768 | Geneva NY Homes for Sale, FINGER LAKES PROPERTIES, Seneca Lake, Cayuga Lake, All of the Finger Lakes. OWNER SAYS MUST SELL! ALL REASONABLE OFFERS WILL BE CONSIDERED. This home is a must see!! House has been totally renovated from top to bottom and freshly painted inside and out. New drywall throughout. All new hardwood bamboo flooring/new carpeting/new ceramic tile. Garage vinyl sided with new roof and 16' overhead door. All new stainless steel appliances. 2 new bathrooms. Most new windows, others are Anderson in great shape. All new light fixtures. New sewer line to front yard. Some new pex plumbing, new high efficiency furnace, new 40 gallon hot water heater, most of the home has new roof. 4 large bedrooms, a large family room, and an additional living room. Wonderful front porch great for relaxing. Nice back yard with partial fence. New landscaping. 1st floor bedroom and full bath would be great for in-law or guests. New 2nd floor laundry is very convenient. Directions To Property: West Bayard St.